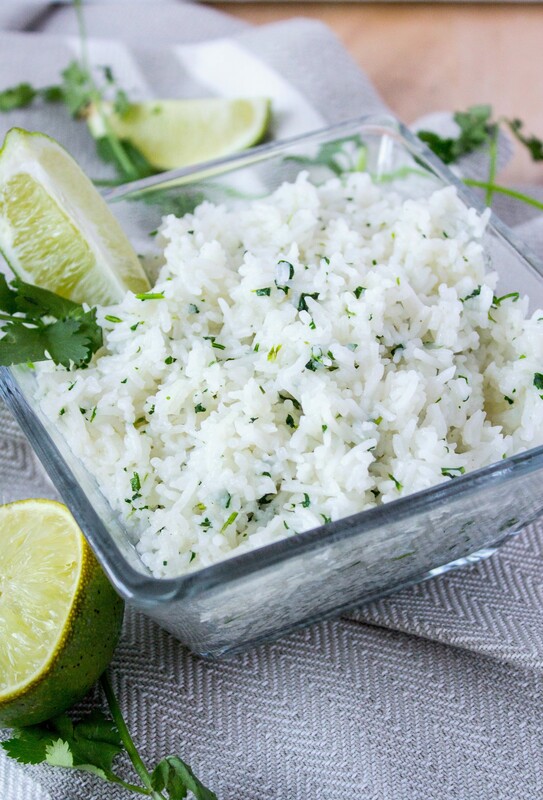 Cilantro Lime Rice – Fluffy basmati rice mixed with fresh cilantro and lime juice. Just like the rice at Chipotle but now you can make it home! I love love love trying new recipes. In fact, most of the recipes I try are new. I like tasting and trying new things so it’s rare for me to make something twice. I make this rice ALL. THE. TIME. It’s one of our favorite accompaniments to a grilled pork tenderloin, which we’ve been making pretty much every other week since we got our grill this summer. And we’re going to keep making it until it becomes waaaay to cold to bear it. Which will be January, probably. Thank you, Georgia weather! I began making this rice a few years ago when I decided to give up gluten for lent (it was an eye-opening experience into the world of gluten-free living and I never ever want to [willingly] go back there). I needed carbs in my life but all I could have was rice, oats, or potatoes. Potatoes take too long to cook and oats were my go-to for breakfast. So I made rice for dinner all the time. 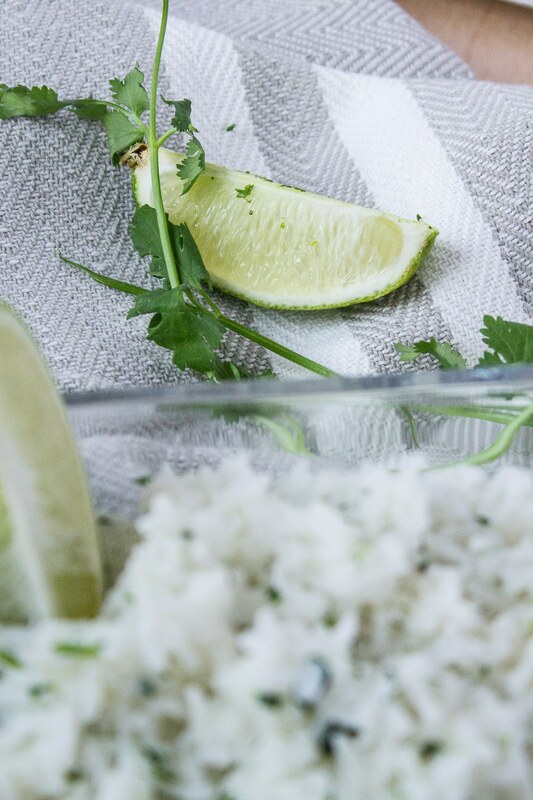 In an attempt to spice things up, I wanted to make the cilantro lime rice that you find at Chipotle restaurants. You know what rice I’m talking about? It’s pretty much the best rice I’ve ever had. So much flavor! So I found a recipe for it and have been making it ever since. Simple as that! I wanted to make sure I shared it with you guys, not only because it’s soooo yummy, but because it’s unbelievably simple to make. And if you have a rice cooker (like me), it’s even simpler. Just throw the rice, butter, some lime juice, salt, and water into the cooker, set it, and forget it! Boom. It’s ready in 12 minutes. When it’s done, just toss in the rest of the lime juice and cilantro and serve. That’s it! Here’s the rice cooker I have at home , in case you’re in the market for one. It makes a max of 3 cups of rice so it’s the perfect size for smaller families but Black & Decker has many bigger sizes, if that’s what you need. Don’t worry, you don’t need to have one for this recipe- the recipe below is for either stove-top cooking or cooking with a rice cooker. If you like your rice nice and fluffy and not starchy or sticky, you must rinse your rice so that extra starch washes away. I love the lime flavor in the rice so I put a total of 3 tablespoons. But if you’re a little hesitant about the citrus, add a tablespoon and taste before adding any more. Make sure to add the cilantro at the end and not while it cooks. 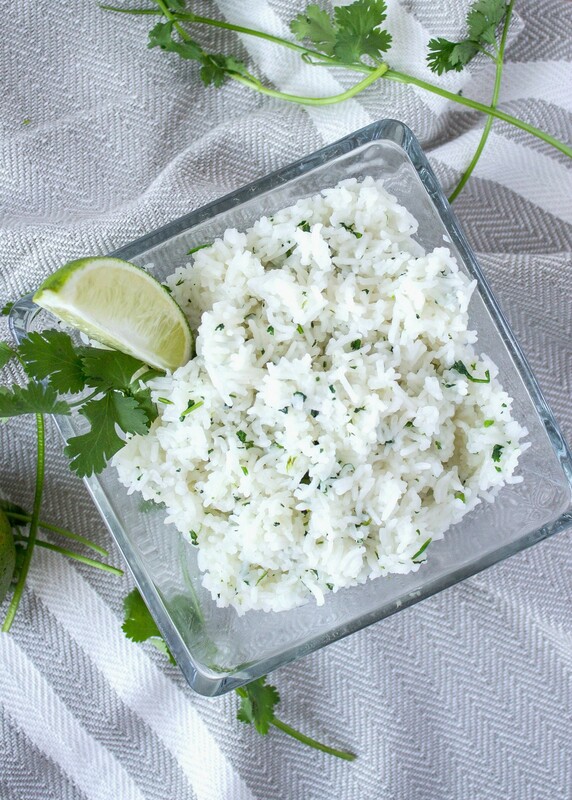 If you cook the rice with the cilantro, it will concentrate the flavor too much and might not taste the way you want it to. This rice also goes really well with some seasoned black beans. I buy mine in a can but I am planning to make my own from scratch. Maybe even a refried version! Stay tuned! It’s one of my favorite go-to dinners and I’m sure it will be one of yours, too. What are some of your go-to dinners?! Like I said above, I love trying new things so give me some ideas!! 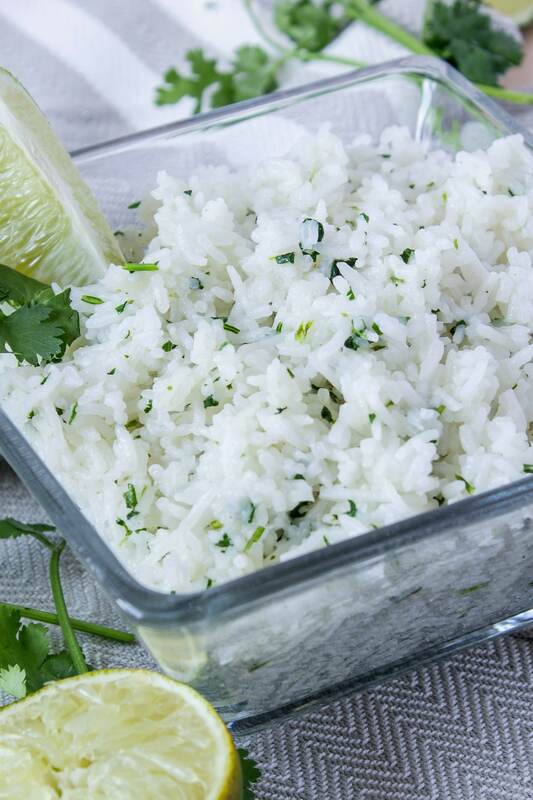 You can finally make the addicting rice from Chipotle right in your own kitchen! And it's only 4 main ingredients! Rinse the rice in a strainer to remove the extra starch. If you like starchy, sticky rice (like I do! ), skip this step. In a medium/large saucepan, add rice*, water*, butter, and 1 tablespoon of lime juice. Bring to a boil and then reduce heat to low and simmer until all the water is evaporated and rice is cooked. 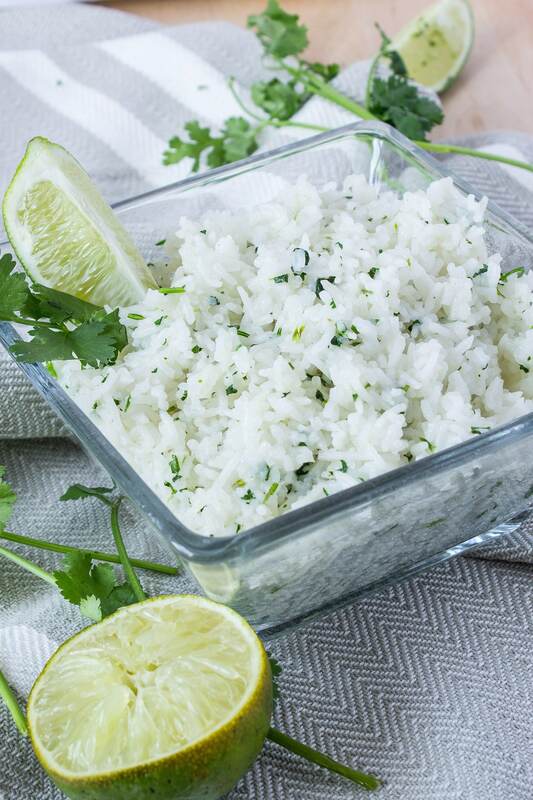 When rice is cooked, remove from heat and add cilantro. Add the remaining 1 tablespoon of lime juice. If you want more lime flavor (like I do! ), add another few splashes, to taste. *If you are using a rice cooker, make sure to use the measurements directed in the manufacturers instructions. They are typically different from cooking rice on a stovetop. Where can i find your recipe for the pork tenderloin? This looks amazing, Cher! Can’t wait to try it! I love Chipotle. This looks fantastic. Can’t wait to try it! Going to make this with cilantro lime salmon! Yum! You just cannot go wrong with the cilantro and lime combo! Say cilantro, rice, and lime, and I’ll be there with a fork. Those are staples in my house, but I haven’t made any recently. Thanks for the reminder and an easy recipe. You’re very welcome! I hope you love it as much as I do! I was just thinking the other night, I wish I had a chipotle rice recipe!! SO THANK YOU! You’re so welcome! So easy to do but yet sooo delicious! So easy and sounds great! Will try this soon! So so easy. And its a great way to use leftover cilantro, which I ALWAYS have when I make guacamole. Thanks for stopping by! Sometimes adding couple simple ingredients will put plain rice into a whole new category. Love this and will be making it. I love jasmine rice… Could I use this instead of basmati? Most definitely! Just make sure to follow package instructions for water amount and cooking time.